One of the most visible, and awe-inspiring, features of the New York City skyline is its Art Deco skyscrapers from the Roaring Twenties. Giants from another age, they are not just symbols of a time when business titans clashed in their battles to conquer the sky. But, also, they are reminders of the city’s first foray into the world of zoning—the specific set of rules that regulated the use, height, and bulk of every property in the metropolis. The “wedding cake” architecture was the result of developers being required to set their buildings back from the street line as they went higher. For architects, looking to move away from the old Beaux Arts designs, the rules nudged them into a modern style: sleek, dignified, and tall. Manhattan’s Art Deco towers of the Roaring Twenties. The so-called Wedding Cake style of architecture was a result of the 1916 zoning codes, which required buildings be setback from the streetline as they rose higher. It’s hard to believe today but before 1916 there were few rules on what a landowner could do on his lot. Of course, any structure had to conform to fire and safety codes. And, from 1901, new tenement buildings were more regulated. But for the rest of the city, there were no restrictions on use or height. Factories could exist side-by-side single family homes, and skyscrapers could rise straight up to the moon. Lower Manhattan was a dense jumble of all kinds of buildings, from high-end offices to factories to warehouses to stores to forgotten 18th century townhouses. The new building technology allowed for structures to rise twenty, thirty, or even fifty stories. The narrow streets were being turned into dark caverns, while throngs of workers poured in and out of the district like blood from a beating heart. It was not just the congestion and shadows that worried planners, social reformers, and government officials, it was also the future growth of the city itself. About half of the City of Greater New York—comprised of the five boroughs of the Bronx, Brooklyn, Manhattan, Queens, and Staten Island—contained land that was either under- or undeveloped. The subway was being built out to all corners, and the automobile and truck were beginning to have their impacts. The outer boroughs were a Wild West of opportunity and, if not checked, could turn the rest of the city into the same unregulated mess as Manhattan. Then there were the merchants along Fifth Avenue, who wanted to keep their boulevard a clean, high-class mall. They saw the encroaching sweatshop factories–which made clothes for their shops–and they didn’t like it one bit. They caused too much crowding, which forced their customers to be jostled by the working-class, immigrant riffraff. The merchants petitioned the city to take action against their complaints. Attempts to cure New York’s urban ills had begun at least as early as after the Civil War. Social reformers were horrified by what they saw spilling forth from the dense ethnic enclaves like Five Points in Lower Manhattan. The slums were hives of disease, poverty, vice, and drunkenness. The culmination of the reform efforts was the 1901 Tenement House Act. The law required that new buildings have large courtyards for light and air. And the structures needed to be set back if they rose greater than 1.5 times the width of the street. By the 1910s, progressives turned their eyes to broader urban problems, beyond tenement housing. Initial actions began in earnest in February 1913, with the creation of the Heights of Buildings Commission (HBC). The HBC was brought into existence by Manhattan Borough President, George McAneny, based on cosultations with lawyer and reformer, Edward M. Bassett, who then chaired the HBC. After studying the building regulations in other cities throughout the world, and what might be constitutional in the U.S., the commissioners felt that the best way forward would be to carve up the land into zones, which stipulated allowable use, height, and lot coverage. Factories would be separated from homes. Buildings would not have outright height caps but would have to setback from the street as they got higher. And courtyards and open space would be required, especially in residential areas. Their findings were summarized in the Report of the Heights Buildings Commission, published in December of 1913. Based on the report, in 1914, New York State amended its constitution to allow for the city to create and enforce the zoning regulations. With its new powers, the city’s legislative body, the Board of Estimate and Apportionment, created the Commission on Buildings Districts and Restrictions (CBDR) to write the new law. The CBDR was also chaired by Edward Bassett, who continued to be the driving force behind enacting and implementing the zoning legislation. Bassett recruited the various commission participants from a relatively diverse (for the time) range of backgrounds, including from real estate, business, and civic and planning groups. Though Bassett had his particular opinions about regulating the city (see below), he drew from a wider population in order to get buy-in from all those who had a particular interest, vested or otherwise, in regulating the city’s real estate. In the end, he was able to garner wide support for his zoning ideas. Though not everyone got everything they wanted, they all saw the possible gains from the plan, and, in the end, went along. As historian Keith Revell discusses, these supporters fell into two categories. First were the real estate and business communities, which included, skyscraper owners and developers, the Fifth Avenue merchants, and tax officials, who saw the rules as helping to protect private property. By regulating, but not liming, building heights, they saw a way to reduce some of the negative impacts of unregulated property markets without curtailing their ability to make a profit from the land. They were also onboard because of the relatively poor health of the real estate market in the years following the Panic of 1907. They saw restrictions as a way to limit oversupply. On the other hand, the city planners, municipal engineers, architects, and public health experts saw the rules as way to control private property for public purposes—to empower the city government to begin to systematically attack some of the social issues generated by a crowded metropolis. These people felt that zoning was the first step to a more aggressive approach to city planning, which, they hoped, would follow in the subsequent years (and this was the side Bassett was on). The Equitable Building is often cited as being the cause of the 1916 Zoning Resolution. This is not true. The codes would have gone into effect even if it was never built. Its bulk became a symbol of the ills of unregulated height, but it was only one example of many being discussed at the time. Before we proceed, however, it’s important to rectify a misconception. A conventional wisdom about New York’s zoning laws was that it was a direct result of the construction the Equitable Building in Lower Manhattan. It is frequently stated or implied that amidst the horror of seeing the 38-story building rise straight up along the narrow streets, government officials fled to their desks and immediately drafted the zoning laws. To be sure, structures like the Equitable Building were on the minds of those crafting the legislation, but it’s important to remember that the formal process began at least as early as February 1913, and perhaps earlier due to agitation by the Fifth Avenue Association, who crafted a statement in 1911, hoping to receive special protections for their neighborhood. 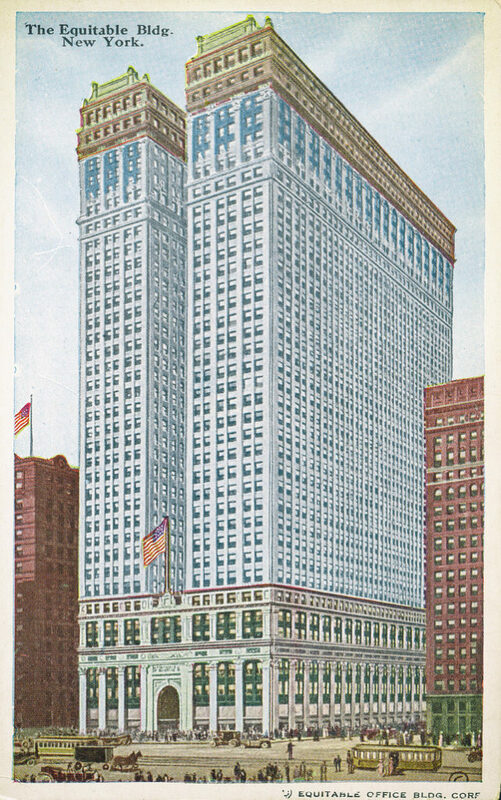 The Equitable Building was announced on August 13, 1912, and renderings were circulated in the press. It was built to replace the previous Equitable Building, which burned to the ground in a fire (which was also a constant concern of city leaders). But it was not completed until 1915, at least two years into the legislative process. Certainly, during its construction from 1913 to 1915, people saw the Equitable Building as a terrible example of too much bulk, but the zoning framers were focused on the entire city, and skyscrapers occupied only one, albeit significant, part of their attention. Lower Manhattan had achieved it cavernous status over the preceding two decades. As examples, the HBC’s report applies the proposed height rules to eight skyscrapers already completed or in the works. Though the Equitable was among the eight, they found all would have been reduced, to some degree, in bulk or height if completed with the rules in effect. In the 299-page, Final Report of the Commission on Building Districts and Restrictions, the Equitable Building doesn’t make its first mention until page 105, and, in total, is referenced on only four pages. Again, this is not to say the Equitable wasn’t on people’s minds, but only that it was one example of many tall buildings and the problems created by them as a class of structures. Suffice it to say, the evidence strongly suggests that the 1916 zoning codes would have passed even without the existence of the Equitable Building. No one building was that powerful. 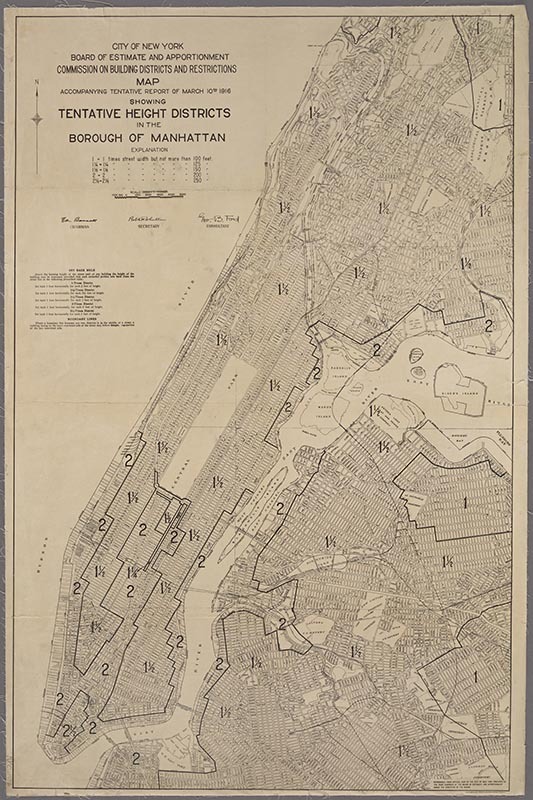 And thus on July 25, 1916, the New York City government adopted the nation’s first comprehensive zoning ordinance. It was “comprehensive” because every single of piece of property with the borders of New York was subject to its rules. Compared to today, it was relatively simple. Three set maps were created, regulating height, use, and lot coverage. The ordinance created five height districts. 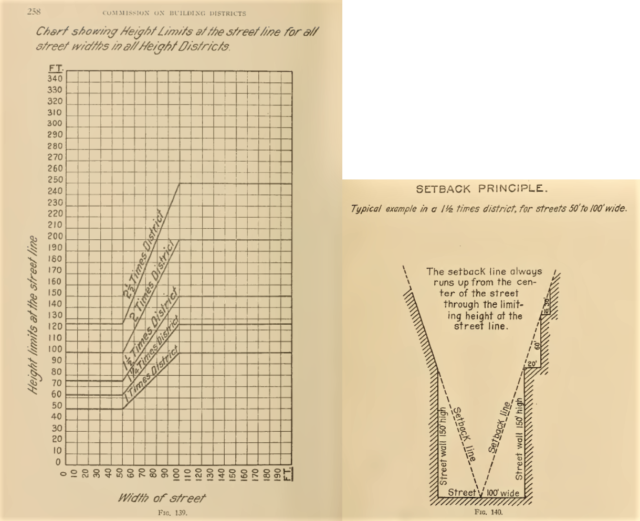 Each was designated by a “multiple,” which established how high a building could rise straight up before it had to be set back from the street line in relationship to the width of the street (1, 1.25, 1.5, 2, 2.5). In other words, the multiple created an “envelope” into which the building had to fit. The idea was that as a building got taller, the setback ensured that some sunlight would be available on the street. The 1916 zoning codes established setback rule for buildings based on the width of the street. These drawing show examples of how the rules would apply. Source: Final Report of the New York City Commission on Building Districts and Resolutions, 1916. For example, say a lot was on a street that was 60 feet (18.3 meters) wide. In a 2-times district, the building could rise 120 feet (36.6 meters or about 10 stories) before it had to be set back. After that it could rise four feet for every two feet set back. A tower could rise to unlimited height if its footprint was no more than 25% of the lot area. The most liberal zone was the 2.5-times district in Lower Manhattan. Much of Midtown was a 2-times district. Most of the outer-borough suburban areas were 1-times districts. The second set of maps established three use zones: residential, commercial (offices, retail, light industrial), and unrestricted (for any type of property but were intended for large polluting factories, utilities, and port and transportation facilities). About two-fifths of Manhattan, and about two-thirds of the entire city was zoned as residential. Lastly, the ordinance regulated the lot coverage, or the area of a building’s footprint relative to the size of the lot. In the most restricted “E” districts, for example, it was necessary that the first floor of buildings cover no more than 50% of the cite, and second floors had to cover no more than 30%. The least restricted “A” districts could have nearly 100% coverage. Height and use districts were based on largely preexisting patterns of development, and their implementation required neither the relocation of industries nor the removal of tall buildings. The ordinance stabilized those patterns, giving official sanction and legal protection to the status quo. At once sweeping and conservative, the zoning ordinance grew out years of failed attempts to unite private and public efforts to guide the growth of the city’s landscape, especially in lower Manhattan. For Edward Bassett, the ordinance did not live up to his hopes and expectations. First, he was of the mindset that the zoning codes would be the first step towards a much more involved role for city government. The zoning rules were an indirect method of planning in that they basically established what could not be done, but not what must be done. As a result, they left the real estate market largely intact. But Bassett’s hope was that once the state and city established the power to control private property, planners would be free to actively arrange New York to produce what they envisioned as the “good” city. But this never materialized. 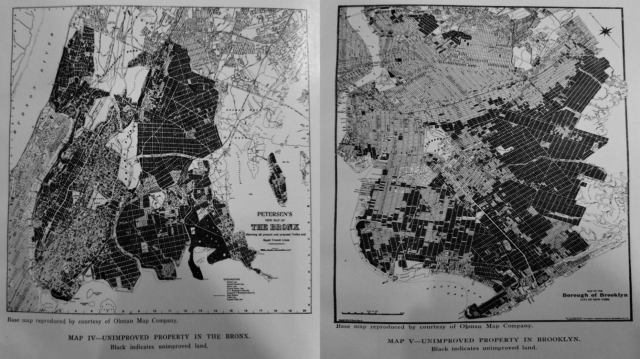 This map shows the distribution of the setback multiples throughout Manhattan, and parts of the Bronx and Brooklyn. The Art Deco giants of the Roaring Twenties were built in 2.5- and 2-times districts. Source. Few skyscrapers pay large net returns. Most of them pay only moderate returns. The cost per cubic foot of tall buildings is greater than that for low buildings.…However, the very tall buildings demand many things out of proportion to their increased bulk….But even though a high building may pay a moderate net return as long as it is isolated and surrounded by low buildings so that all its floors and offices are light and attractive, the result may be very different after its is surrounded by similar buildings, shutting off light and reducing rentals on the lower floors. For plots of normal size, it is estimated that buildings will reach their economic height when through the application of the court and set-back regulations the area of the building has been reduced to about 60 per cent of the area of the plot. This will mean that for buildings on an interior plot on a sixty foot street, the economic height limit will be about 14 to 17 stories. On a corner plot on a 100 foot street, the economic height limit will be probably 16 to 20 stories. Though there was nearly a decade-long lull in skyscraper building after 1916, because of World War I and a sharp depression in 1920-21, when developers returned to highrise office construction in the mid-1920s, they did so with a vengeance, constructing the great Art Deco giants we know and love. But Bassett complained that developers were gaming the system, and that height caps should have been imposed. By amassing very large plots, developers could construct their super-high towers and still follow the zoning rules. The completion of the Empire State Building in 1930, for example, only helped to fuel the belief that the law was almost as good as no law at all. In the end, urban economics would continue to assert itself. Density and congestion in the central city were going to be the norm. We would get the skyline we have today as a result. But the 1916 codes, at the time, represented the most aggressive approach a government could take to obtain approval from the city’s diverse communities. The zoning founders had in mind a much more regulated and dispersed city. They were operating with very specific beliefs about the evils of congestion and hyper-density, and they were determined to impose their ideas on the city. Since then, however, economic science has developed tools to better analyze the costs and benefits of urban life. In the next blog post, we turn to what this economic analysis would say about the New York’s 1916 zoning resolution that changed America. Continue reading Part II here. The sun is the mother of life. Humans, like all biological lifeforms, need sunlight to survive and thrive. From it, they extract vitamin D; warmth for their furless bodies; and a general sense of well-being. Sunlight, however, is a scarce commodity; and even more so in the modern city. And as such, cities produce something of a paradox: we create them to satisfy our needs and wants—to provide jobs, housing, access to amenities, etc.—and, in the process, they generate some undesired outcomes or externalities. There is no free lunch in the urban world. One person’s “agglomeration economies” is another person’s traffic congestion. One woman’s fabulous views are another one’s shadows. One man’s trumpet makes music; to another it makes noise. And so on. The ultimate—and age-old question—is: how do we create efficient cities—ones that provide the maximum flexibility and benefit, while minimizing the negative externalities? 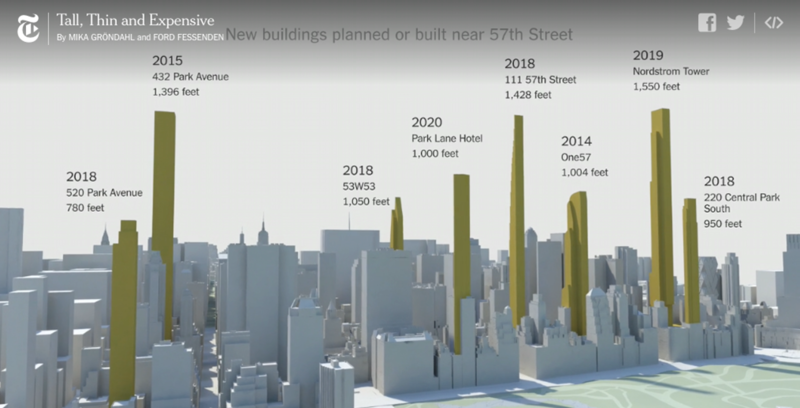 Today, one of the biggest controversies in the real estate world is the construction of superslim, supertall towers around New York’s Central Park. It seems that when one is announced there is an instant knee-jerk reaction against it. Critics present a laundry list of reasons about why they are “bad.” One item that dominates is that of the shadows they are likely to cause. Graphics of their effects on Central Park exacerbate the perceptions of darkness, by giving snap-shop depictions of the longest shadows likely to be cast at any time. But are city shadows all bad? The answer is no, as they can provide both costs and benefits, which need to be fully measured and understood before we can draw conclusions and consider policies that are directly aimed at limiting real estate in the name of the almighty sun. The new crop of supertall, superslim skyscrapers in Manhattan–presented with shadows at their worst. Source: Vanity Fair. Why might shadows be good? First, is that in hot summers, shadows provide shade, not just to the people who are walking around, but also for the neighborhood to protect against the heat island effect. Plus, shadows can reduce electricity bills from air conditioning. In Manhattan, real estate brokers try to peddle north-facing apartments—which get less sunlight—as the exposure allegedly preferred by painters, who apparently need softer, indirect light for creating their masterpieces. Residents in south-facing units—with less shade—are subject to oven-like temperatures from the direct beams of the sun. Sunlight reflecting off buildings can become “death rays,” attacking the random pedestrian (arguably, the exact opposite of the shadows problem). Finally, a building in a shadow might be more affordable to someone who would prefer living in the central city near employment opportunities rather than paying for a higher cost, sunnier unit. Access to sunlight might not be all that important to someone who spends most of the day away from home. But, of course, people, in general, enjoy access to sunlight. It seems to have a calming effect and improve mood and health. Companies prefer locating in glass box skyscrapers because their workers like sunnier offices with more natural light. Shadows might also hamper the ability of trees and plants to grow and can block light on rooftops that might otherwise be useful for solar panels. Shadows on the streets may increase the likelihood of crime and may, more broadly, diminish the quality of urban life. In cold winter months, shadows can increase heating costs. But perhaps the key problem of shadows is that there is little understanding of their true impacts throughout the day and year. Shadows in the peak of the summer can be helpful for cooling and energy costs, while perhaps can negatively affect moods or well-being. During cold winter, shadows can make the city colder and require more heating, but don’t affect people on the street as much because it’s too cold to spend much time outdoors. And throughout the day, the sun’s position in the sky is changing; one person’s shadow in the morning becomes clear sunshine in the afternoon and vice versa for someone else. In essence, the shadows problem is quite complex with its impacts on individuals varying throughout the day, the season, the climate, the topography, the location within the city and across the planet, and based on the nature of the built environment. Until recently there have been very few, if any, systematic measurements of the amount of shadows and their impacts. Rather their effects on the city have been left to our imaginations or to simple snap-shot representations. But this is starting to change. Thanks to advances in data collection and computer science, the ability to measure the quantity of shadows in cities is, so to speak, coming out of the shadows. If we can measure the degree of “shadowification,” we can then see how it correlates with well-being and other important variables. A recent paper by a team of computer scientists attempts to get closer to comprehensive measurement of shadows throughout the day and across the city. 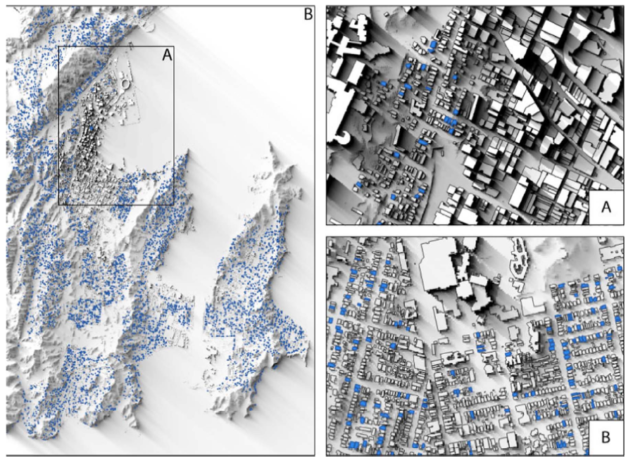 “Shadow Accrual Maps: Efficient Accumulation of City-Scale Shadows over Time” (2018), by Miranda et al,. presents newly-developed algorithms to measure the total accrual of shadows using computationally efficient methods. Part of the analysis includes creating net shadow scores, which include both the positive and negative effects. We see that these shadows behave as expected – a lower angle of the sun in winter causes shadows to cover the entire analysis area, while a higher angle in summer results in a tighter shadow area. Note that even though buildings, whether tall or short, cast long shadows at low sun angles (mornings and evenings), its contribution to the overall accumulation is small as reflected in the visualization (p. 10). Again, it’s worth stressing that the shadows that would fall on Central Park from these new structures is the worst in the winter afternoons, the very time when the park is least likely to be used. Furthermore, when they compare the slim towers to hypothetical alternatives of shorter but bulkier versions, they find that the latter have a greater negative impact than the former. 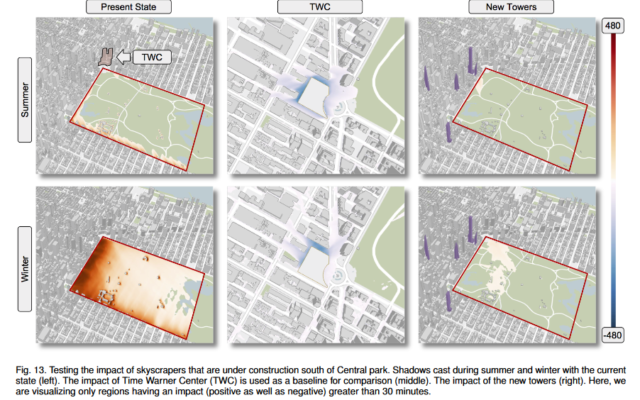 But given the ability to generate more precise shadow maps, this begs the question: what’s the cost to city dwellers? For this, we need to look at the net effect of shadows on things that we care about, such as happiness or the value of real estate. To this end, a recent study, called, “Valuing Sunshine,” provides some first estimates to this question. In particular, the authors measured the average number of hours of sunshlight that fall on some 5,000 houses in Wellington, New Zealand. They then investigated the relationship between average hours of annual sunlight and housing prices, controlling for a host of other things that might determine the value of the property, including the views. The key problem to measurement here is that, ideally, all non-sun-related factors need to be held constant or controlled for, while variation in sunlight access across the city should be as large as possible, in other to better separate out the signal from the noise, as it were. Their focus on Wellington to isolate a pure “sunlight effect” had advantages. First, the city is small, and homes are relatively homogeneous, which helps reduce some sources of variation which might mask or confound the sun’s impact. Second, Wellington’s economy and housing market has been relatively stable over the last decade or so—again, reducing noise in measurement that might have come from the global bubble and collapse in the 2000s. Third, Wellington’s climate is rather moderate. In summer, its average maximum temperature hits only 69°F (20.5°C), while in winter, the maximum average temperature is 52°F (11.1°C). This helps diminish the effect of shadows on energy costs. Lastly, the geographical topography of the city contains several hills and valleys, creating large variation in sunlight exposure for the houses in the sample. As the authors say, “Thus, it is not difficult to find houses that, located in the same narrowly defined neighborhood, have very different exposure to direct sunlight due to the effects of hills, valleys and nearby buildings” (p 270). In short, they find that, on average, a house that receives an extra hour of sunlight per day throughout the year has a 2.6% higher price. For the average house in Wellington that additional hour of sunlight is worth about $NZ16,000 ($US11,000). Or, on the flipside, a neighbor who is suddenly put in shadows for an extra hour per day due to a new building next door can expect to lose about 2.6% of the value of the house, on average. Given the ability to measure the total additional hours of shadows from new construction, it seems a relatively straightforward exercise to “plug in” the shape of a proposed structure and estimate the average reduction in sunlight per hour per day on surrounding buildings and parks. Then a Pigouvian tax could be imposed of say 2.6% of the market value of the structure for each lost hour of direct sun (again an actual tax value would need to be determined from more research). If the levy is worth it to the developer, he goes ahead with the project, pays the tax, and the money is disturbed to the harmed parties. If not, he has the option to redesign the project to reduce the shadows and the tax. This policy has the advantage of being relatively simple and straightforward, and the tax burden will fall heavier on those building taller or bulkier structures. But what’s to be done with the tax money given to owners of a park (the City)? Here the government would need to come up with ways to improve the quality of parks to offset the loss in user-value; this might come from adding trees or other amenities within the parks, or by providing more green space elsewhere in the neighborhood. The problem with the tax, however, (aside from the fact that it might be hard sell within today’s political climate) is that new construction provides both costs and benefits to surrounding properties. On one hand, it might increase foot traffic to stores or improve the general desirability of the areas and thus raise land values. On the other hand, it might create more traffic congestion, noise, and shadows. This create something of a problem for Pigovan taxes in the city, since there are many negative externalities that would have to be taxed, while at the same time the positive externalities should be subsidized. What’s the right tax policy? Unlike, say a carbon tax on property owners to reduce C02 emissions, in case of new construction, the right policy is less clear. A more generalized and easier-to-implement policy might be some form of market value insurance. The idea is that property owners pay a small annual premium against the loss of value to their properties due to changes in the value of the neighborhood itself or due to the actions of neighbors (and not due to market fluctuations or the actions of the owner). The point is that in a dynamic, growing city, new construction is necessary and inevitable, and can have both positive and negative effects on the surrounding structures. If owners had some means of being compensated, those harmed by shadows will get their due, and will hopefully avoid employing the NIMBYism that seeks to stop the city dead in its tracks. The problem of city shadows perfectly illustrates the paradox of cities: they are both the solution to, and cause of, many problems with which humans must contend. But fundamentally cities are engines of growth and well-being. In the 21st century, large metropolises, like New York, are increasingly important in our lives. But who gets to define what they will look like in the 21st century–those who want to keep it in a form a status, or those who want to accommodate all who want to call it home? The success of humanity over the long run has always been based in fostering increased trade and human interactions. The key to the efficient—well-functioning city—is to identify the negative externalities that arise from dense living and devise policies that alter the incentives to better balance the good with the bad. Simply saying “no” to growth and change may feel right, but in the long run, its rarely been a winning policy. Let’s not be afraid of our own shadows. Their sample includes transactions from 2008 – 2014. During this time, the average exchange rate was 1NZD = 0.76USD. Today the rate is 1NZD=0.68USD. Also note, the average house in their sample gets 6.7 hours of sunlight in winter and 10.7 hours in summer. A city might also consider a Pigovian tax for shadows just in parks, especially if the units remain empty for much of the year. Note this is Part III of a three-part series on the economics of skyscrapers. Part I can be read here and Part II can be read here. Let’s start with “good economics.” By this I mean that the constructed height of a supertall building reflects the best balance of the revenues and costs. 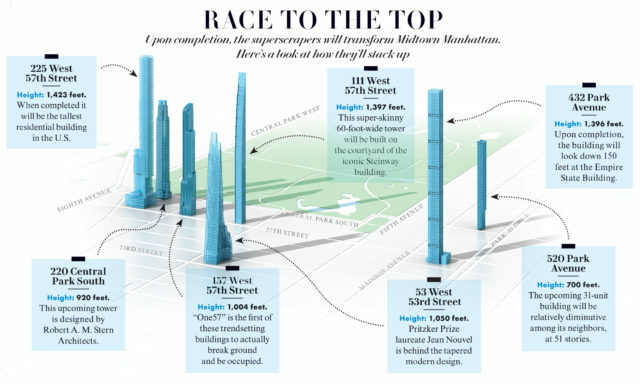 That is, a supertall building may simply be the result of matching supply with demand at a particular location. However, at times, forces may be at work to artificially raise the price of building space, or artificially lower the cost of construction—hence “bad economics.” Developers are maximizing profits, but the income or costs deviate from the correct values because of illegal or unsustainable reasons. The “selfish motives” theories include many of the typical beliefs about supertall buildings—they are built by greedy developers eager to show off or claim an “ego prize,” or they are built by dictators seeking to legitimize their rule. In this case, developers are adding floors above the (good or bad) economic height for non-economic purposes. Lastly, supertall buildings are often built as a means of sparking urban growth or to put a city on the “economic map.” By building a landmark, governments or developers seek to increase foreign direct investment, tourism, or employment opportunities. From Left to Right: Bank of Manhattan Trust Building, Chrysler Building, Empire State Building. Source: CTBUH. But the question remains: what is the evidence for the various theories? Regarding the world’s record-breaking buildings, a key problem is the very small sample size—only 12 buildings since 1890 have held the record. Thus, a case-study approach that looks at the historical record, including from books, newspapers, and trade publications, seems reasonable. While case studies do not prove things conclusively, they do suggest some theories over others. The Bank of Manhattan Trust Building, at 40 Wall Street, was the first of three Manhattan skyscrapers to break the world record during the Roaring Twenties. At 927 feet (283 meters) it surpassed the Woolworth Building (792 feet, 214 meters), which held the record since 1912. It was a speculative venture by the Starrett Brothers (who were also the general contractors), an investment group lead by G. L. Ohrstrom and the Bank of Manhattan itself, who was to occupy seven floors. Evidently, the original designs in 1929 called for a 47-story structure; but were then changed to 60 stories, and finally, architect H. Crain Severance drew up plans for 67 stories. What seems to have happened was that some of the investors were pushing for a taller building, but there were only certain lengths to which they willing to go. It is clear, however, that Walter Chrysler wanted the world’s tallest building, when, in 1928, he announced his intention to build a 68-story skyscraper (but eventually topped out at 77 stories). But again, it’s important to keep in mind that the economics were in Chrysler’s favor. His building was a block away from the hypothetical project of Clark and Kingston, who, after crunching the real estate development numbers, determined that, in 1929, a 63-story structure was the profit maximizing one. Chrysler’s speculative project was in the heart of the booming midtown district near Grand Central Station. For Chrysler and Van Alen, grabbing the record after secretly unveiling the chrome spire amounts to a cheap (that is, low-cost) trick. In short, the cases of Bank of Manhattan Trust and the Chrysler Buildings show that multiple motives are supported: Economics, Competition, and Ego. But economics needed to be present to pay for the ego. The evidence also supports the idea that the developers of the Empire State Building—John J. Raskob and Al Smith—wanted the world’s tallest building because Raskob considered Chrysler a business rival. But the story, of course, is more complex. 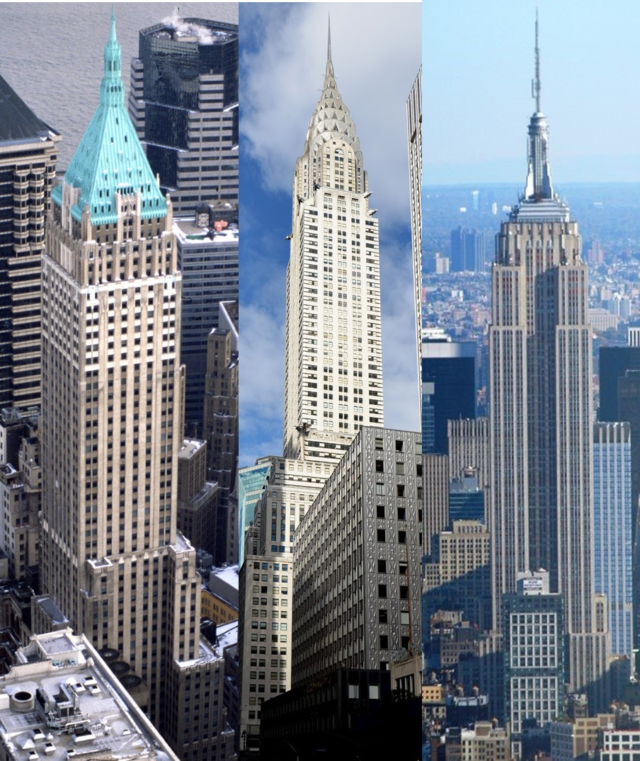 First, the Empire State Building sits on a lot that is about 91,000 square feet. This is an even larger lot than the one Clark and Kingston used for their exercise, which was about 84,000 square feet. The bigger the lot, the more favorable are the skyscraper economics. Second, while the neighborhood was mostly retail, warehousing, and loft buildings, Raskob and Smith intended their project to also be used for “placemaking.” They were betting on the fact that their iconic structure would lure more Class A office space to their area. In short, the Empire State Building offers support for several theories: Economics, Placemaking, and Ego. Left: Twin Towers. Right: Sears (Willis) Tower. Source: CTBUH. In the 1960s, business leaders were worried about lower Manhattan’s future, as the district and port had fallen on hard times. Thus was born a plan to create the World Trade Center site to revitalize the neighborhood. Ultimately the project was led by the Port Authority of New York & New Jersey (PA), an independent, interstate government agency established in 1921 to oversee and rationalize port operations in the region. For the first time in the city’s history, the world’s tallest building would be financed and built by a governmental organization. During the 1960s, slum clearance and urban renewal were all the rage. The Word Trade Center project fit right into that mold. Evidently, once the PA took control, the marketing team suggested that constructing the world’s tallest buildings would be good advertising for the site. In short, the evidence suggests multiple theories: Placemaking, Urban Growth Strategy, Advertising (though I can’t rule out the ego of PA president, Austin Tobin). Today, Sears is on the brink of failure; yet another victim of internet commerce. But in the early 1970s, Sears, Roebuck and Company, headquartered in Chicago, was the largest retailer in the world (like Woolworths before it). In 1969, it enjoyed profits of $441 million from $8.9 billion of revenue. Sears had more than 355,00 employees worldwide. The area is one that is experiencing what real estate men like to call a renaissance. New office buildings are shooting up on and around Wacker Driver. “Wacker Drive is becoming the Park Avenue of Chicago,” Mr. Rubensten [a real estate broker] said enthusiastically. Not unlike the Bank of Manhattan Building, Sears downplayed the idea of height competition. “The question then was whether to shorten the building or reshape it and maintain the height,” Mr. Dunlap [an architect at SOM] said. “We kept the height, for reasons of proportion, and aesthetics. There was some mention that it would be nice to have the world’s tallest building. But the idea of a space race is silly.” (NY Times, Oct. 18, 1970). Theories supported: Economics and Placemaking. Left to Right: Petronas Towers, Taipei 101, Burj Khalifa. Source: CTBUH. The Petronas Towers, headquarters of Malaysia’s state oil company, were completed in 1998, as the centerpiece of Kuala Lumpur City Center, a 100-acre, government sponsored project. The neighborhood and towers were part of a larger program of infrastructure investments, initiated by Prime Minister Mahathir Bin Mohamad. The government was seeking to diversify and modernize the economy, which was dependent on the sale of commodities, such as palm oil, rubber, tin, and crude oil. Theories supported: Economics, Urban Growth Strategy, and Placemaking. As with other very tall buildings in Asia, the construction of this one is as much about politics and pride as commerce. “As the world’s highest building, Taipei 101 will attract attention to Taiwan’s excellence, and carve ‘Taiwan first’ in the minds of people around the globe,” President Chen Shui-bian said…. Theories supported: Economics, National Pride, Ego. When we developed Burj Khalifa, we had a clearly articulated vision of not just delivering an icon that underlines the ambitions and spirit of global collaboration that defines Dubai, but also to maximize the value of the land by creating a truly “vertical city.” Burj Khalifa is at the heart of Downtown Dubai, our 202-hectare megadevelopment, and it adds incremental value to the destination. Bigger. Brighter. More outlandish. Construction-fevered Dubai is almost Gatsby-esque in its audacious thirst for reinvention. This once-sleepy port of pearl traders and pirates is gunning to turn itself into one of the great capitals of the postmodern world. Theories supported: Urban Growth Strategy, Placemaking, Ego. Based on these case studies, what can we conclude? First, we see evidence for several theories, from pure economics, to urban growth strategies, to pride–both personal and civic–to ego and competition. Second is that money must be available for these large projects. But where the money comes from varies over time and space. Early projects were privately financed, while more recent projects are financed or subsidized by governments. Nonetheless, all these skyscrapers were built in major global metropolises with rapid economic and population growth. 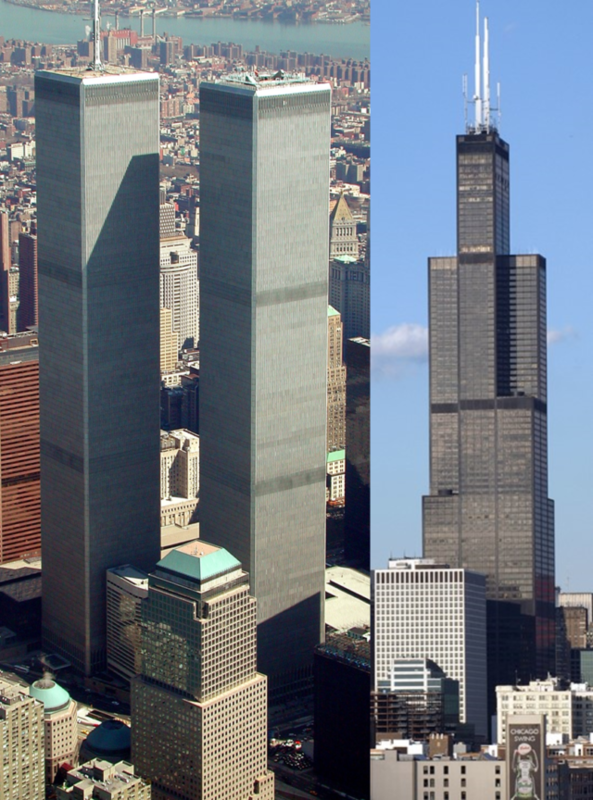 Since the Twin Towers (but excluding the Sears Tower), the norm has been for the world’s tallest buildings to be part of a larger urban and national economic development plan. The buildings are centers of newly-created neighborhoods, and meant to enhance feelings of national pride and create iconic structures that advertise the city. The extent to which the world’s tallest buildings are built by autocrats is not clear. The United States, Malaysia, and Taiwan and are democracies; while the UAE and Saudi Arabia (which is constructing the next record breaker) are not. Whether the structures directly pay a reasonable return on investment is often beside the point if they succeed in generating wider forms of economic growth and well-being. To my knowledge, no study has tried to measure the spillover benefits that accrue from these soaring towers. And there is something else to consider. By building the world’s tallest building, it extends the limits of human technological knowledge, which can generate unintended benefits applicable in other areas of our lives more broadly. This will be the subject of a future post. Continue reading Part I or Part II. Another method is to collect a larger data set on skyscrapers more broadly and perform a statistical (regression) analysis that looks at the effects of one or more variables on skyscraper heights or counts, holding other important variables constant. For this post, since I’m focusing only on the record-breakers, I will use the case-study method and leave a discussion of statistical results for a future post. My understanding of the history of the Empire State Building is based on John Tauranac’s book, The Empire State Building: The Making of a Landmark. My sources for this section are Eric Darton’s (1999) book, Divided We Stand: A Biography of New York’s World Trade Center, and Angus Gillespie’s (1999) book, Twin Towers: The Life of New York City’s World Trade Center. Edward Glaeser is the Fred and Eleanor Glimp Professor of Economics in the Department of Economics at Harvard University. He one of the world’s leading experts on the economics of cities. He is the author of Triumph of the City: How Our Greatest Invention Makes Us Richer, Smarter, Greener, Healthier, and Happier. JB: While there are a handful of research papers in economics on investigating the causes and consequences of skyscrapers, such as by Helsley and Strange (2008) and Ahlfeldt and McMillen (2017), it seems that, by and large, even for urban economists, this topic is not a significant area of research. Do you think economists have ignored studying the economics of skyscrapers? And if yes, what kinds of research questions might be of interest to economists? EG: I would go further and suggest that economists have spent too little time on the technology of building more broadly. Building technologies have shaped our cities and suburbs for centuries. They provide important sources of exogenous variation and are intrinsically interesting. For example, one of the unfortunate side effects of excessive land use controls is that building often occurs on a one-off basis. Mass production becomes impossible and there are large costs savings from building multiple units at once. Consequently, land use controls increase effective housing prices both by restricting the number of new units and by pushing construction into an inefficiently small scale. Perhaps, this helps explain why productivity advances have been so limited in construction in recent years. That weak productivity growth is itself an important topic for economic research. Skyscrapers are themselves a particularly fascinating technology. The origin of the skyscraper is itself a fascinating story showing the ways in which ideas flit from sector to sector. I tend to give early credit to Joseph Paxton, the English gardener who had used metal frame structures for greenhouses. His inexpensive plan was chosen for the Crystal Palace exhibition in London and this then inspired Napoleon III and the French architect Victor Baltard. Baltard then used metal frames for Les Halles and for St. Augustine’s church in Paris. It would take another decade for William LeBaron Jenney to start using steel frame for a skyscraper: Chicago’s Home Insurance Building. Jenney performed the crucial combination of connecting metal frames with Otis’ safety elevators. His idea spread like wild fire in Chicago and was then adopted and improved by Louis Sullivan, Daniel Burnham and many others. This provides a classic model of how ideas spread across dense urban areas. The skyscraper has two effects on the price of land. First, they allow more usable space on the same spot of land which should push land prices up. Second, they allow more usable space overall in the city which should push down the price of usable space and indirectly the price of land. One hypothesis is that rising urban land prices in the late 19th century were driven by the first effect, while declining land prices during the early 20th century were driven by the second effect. The connection between new building technologies and urban real estate cycles is a particularly pressing topic for future research. Tallest Skyscrapers around the world. Source. JB: Do you have any thoughts about the debate about whether skyscrapers are economically too tall? 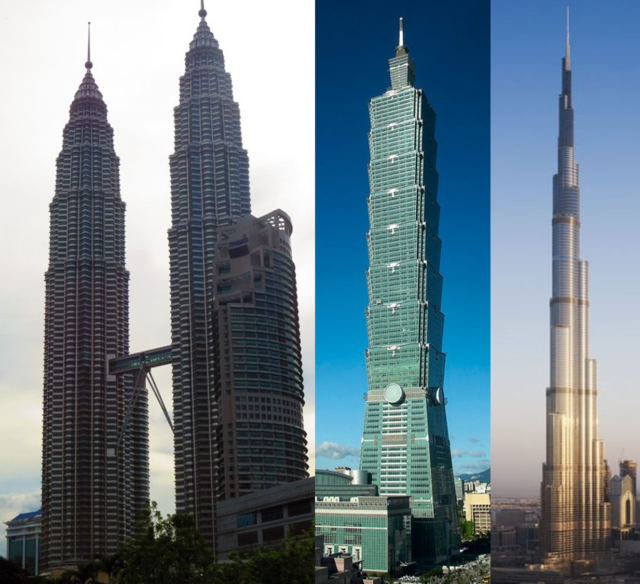 The common perception is that the world’s (or region’s) tallest buildings are driven by the desire to claim an “ego-prize” (such as discussed in Helsley and Strange (2008)). Yet, in principal, one can think of a host of other rational reasons for excessive height—such as place-making or inducing agglomeration benefits by attracting high-skilled workers. How do you view this? And do you think “too tall” construction is good or bad for cities? EG: I don’t have that much new to say about this question. The usual stylized fact is that building exhibits roughly constant returns to scale up to about 50 stories, but then costs rise dramatically after that point. This suggests that some skyscrapers (under 50 stories) are too short while others (over 100 stories) are too tall, except in conditions of extreme demand. I think both phenomena are worth more study. The too small phenomenon is important for cities because if there is some force that artificially restrains the ability to build up, then the supply of usable space will be too small and prices will be too high. One candidate explanation for skyscrapers being too small is land use regulations. Yet developers often speak about their unwillingness to build up because of their limited appetite for risk. Credit restraints may also be important. “Too tall” skyscrapers presumably reflect exaggerated expectations about future price growth, or the egos of their builders. 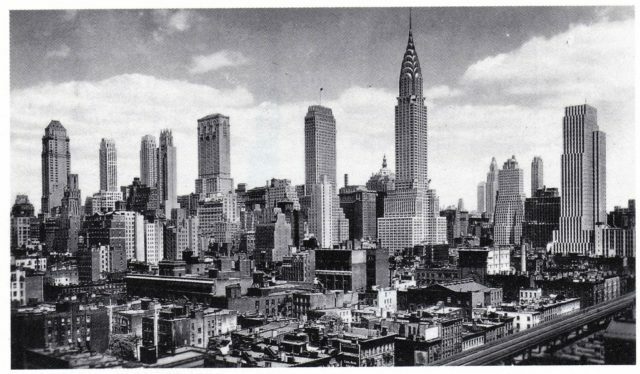 Both phenomena were on display in New York’s great skyscraper race of the late 1920s. Both phenomena may also have been on display in Dubai a decade ago as well. The issue of externalities from height is particularly fascinating. The original New York City zoning ordinance of 1916 was motivated by the excessive shadow allegedly cast by the Equitable Building on 120 Broadway. There are still complaints about shadows and views to this day. On the upside, large towers help agglomeration economies to flow and potentially reduce traffic congestion. A city in which people ride elevators and walk from tower to tower can be much more functional than a city that is mired in cars. JB: One of the vigorous current debates about tall building construction is regarding supertall luxury apartment buildings in places like New York, San Francisco, London, and Vancouver. Detractors argue they exacerbate gentrification and income inequality, while harming the quality of street life, and throwing shadows on the street and in parks. What is your view of the effect of tall luxury apartment buildings on cities? Should they be taxed or regulated? Or should they be encouraged? EG: I think that the starting point has to be a serious quantification of the externalities that I just mentioned. Almost none of the land use regulations that cities have ardently adopted for over a century have been justified by any serious quantitative work. The existence of even the smallest externality, such as a shadow, has been seen as justification for massive interventions in the housing market. My own belief is that we have almost surely limited skywards construction excessively in our most successful cities. I think that the externalities from height are real, but that they are overwhelmed by the pure economic benefit of building, which can be quantified by comparing construction costs with the current price of usable spice. More than a decade ago, I estimated that the cost of building another story (which is the marginal cost of extra space) was less than one half of the market value of that space in Manhattan. Prices are even higher today. I can’t imagine that the negative externalities from building are anywhere near high enough to justify such a massive implicit tax. One of the reasons to be skeptical about these negative externalities is that if people don’t live in an urban skyscraper, they will live somewhere else, and there are also externalities from other forms of building. Suburban homes lead to more driving which generates congestion and pollution externalities. Restricting construction in America’s more temperate cities, which include Seattle, San Francisco and Los Angeles, induces more construction in hotter places like Houston. The impact of that rerouting of construction is more air conditioning and more carbon use. Planned and Completed Luxury Apartment Buildings in Manhattan along “Billionaire’s Row.” Source. JB: One of the main arguments in Chapter 6 of Triumph of the City is that landmarking, historic preservation, and zoning are driving higher housing prices, and that places like Paris and New York should allow residential building height to increase according to the demand. But this raises several important questions. How can a city realistically make such a plan? It seems that nearly every large city in the West is prevented from allowing the housing market to operate more closely to match supply with demand for all income brackets. What might be some realistic ways that governments can prevent the NIMBYists from vetoing housing market reform? Do you see any good examples of denser older cities that have been able to overcome the NIMBY problem? EG: I think that there are two reasonable political paths against NIMBYism. The first is top down. Strong mayors often like building up, because of the construction jobs, property tax revenues and agglomeration effects. Consequently, leaders like Michael Bloomberg, Richard Daley and Boston’s Marty Walsh have all fought for more permissive construction environments. Generally, the smaller the jurisdiction, the less likely will political leadership see the upside in construction. Part of the problem is that restrictions benefit current home owners at the expense of prospective external resident, and the smaller the jurisdiction the larger this problem will be. The second path is the new YIMBY movement, which is a ground up swell supporting new development. In a sense, that movement recognizes that incumbents, typically an older generation, has enriched itself through land use regulations at the expense of a younger generation. We have yet to see the YIMBYists achieve significant change, but the movement is a really welcome addition in urban political discourse. In terms of policies, the question becomes what level of polity is implementing the change. At the local level, the easiest change is just to allow more as-of-right high-rise building rules. As-of-right means less regulatory uncertainty. If there are real externalities, we can certainly impose impact fees, but these should be a replacement for a lengthy permitting process. At the state level, the government needs to encourage lower levels of government to permit more housing. One approach, typified by Massachusetts, Chapter 40B is just to over-rule local land use controls and impose a more permissive state level building code. A second approach, since in New Jersey’s post-Mt. Laurel system or Massachusetts 40R or 40S, is to provide financial incentives for localities to encourage more building. State transfers, for example, could be tied to the level of local building.